The McFarland School District offers a vast amount of environmental and outdoor educational opportunities for the students. Whether it is attending classes or taking field trips, the district understands the need to keep outdoor education as part of the K-12 curriculum and beyond. Our community understands the importance to explore McFarland and other Wisconsin areas. We have found that year-round hands-on and outdoor learning gives students and community members a greater sense of accomplishment, knowledge of the "outdoor" world and respect for our environment. The students in the MSD have opportunities to explore our outdoor learning spaces that include the McFarland School Forest, Waubesa (WIS) Prairie, and the School Food Gardens. Complementing our outdoor learning, classroom projects are also an important part of the learning process. Some of the classroom projects have been: archery, creating marsh filters to understand how the marsh cleans our water, studying habitats and seed processing as part of prairie restoration. Earth Day programs have included learning about our carbon footprint and the the impact we have on our planet. Students are encouraged and given opportunities to create and run environmental clubs, work on community service projects, as well as participate in nature art and photography. Each year, students take trips off the beaten path. Some of the trips include visiting area parks and farms, the McFarland Community Garden, and the MacKenzie Environmental Center. Students also take walking field trips to our local historical sites and McFarland parks. Other opportunities include trips to Aldo Leopold Nature Center, Camp Timberlee, and Trees for Tomorrow as well as biking Southern Wisconsin. Outdoor educational partnerships within the McFarland community offer opportunities as well. 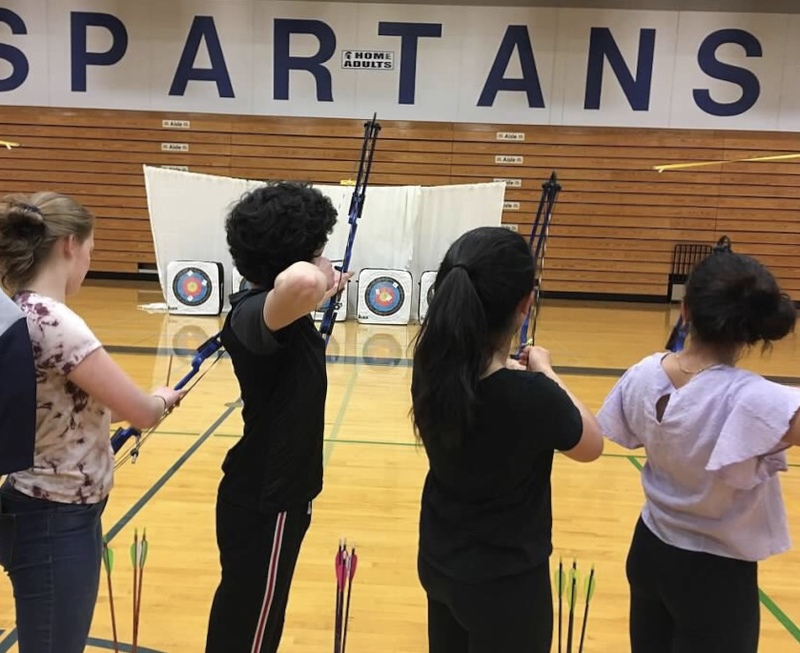 The ongoing partnerships with various McFarland organizations and businesses allow our students to participate in many programs. Examples of some of our programs include: outdoor games, boaters safety courses, Spartan Clay Busters and usage of the local Village of McFarland Parks. Our students also work with the McFarland Bird Festival, take part in McFarland Community Service Day projects, are involved in the Boys & Girl Scouts and 4-H programs. We work with many organizations throughout Wisconsin including the DNR, UW Stevens Point, Hope Rod and Gun Club, Aldo Leopold Nature Center, Madison Audubon Society, Henry Vilas Zoo, UW Extension and many more. There is always room to grow in nature. The 6.2 acres of the McFarland School Forest is adjacent to Indian Mound Middle School and was established in 2006. The School District, along with the Village Conservation Park, encompasses a total of approximately 16 acres, with the opportunity to see and study several ecosystems in a small area. The areas west of Exchange Street include: the McFarland School Forest, Thrun Marsh, Indian Mound Park, and Lewis Mound Group. Within the conservation areas, you will find many hardwood trees, homes for an abundance of wildlife, Native American Mounds, an Oak Savannah restoration area, and hiking trails. Taking the trail to the South you will find Jaeger Park and the Yahara River, which connects Lake Waubesa and Mud Lake. The river allows for fishing, canoeing, kayaking, fishing, bird viewing and studying aquatic species. The Conservation Park is used for recreation and as an “outdoor classroom” for the students and members of the community. In 2007, the Waubesa School started a 1.1 acre Tall Grass Prairie. Through many programs, the WIS Prairie is used as an outdoor learning space for 3rd-5th grade students, as well as, community members. The programs have ranged from plant ID, habitat studies and restoration. An important program, that is taught by the Outdoor Education Coordinator, local volunteers and the 5th grade teaching team, leads the 5th grade students in the prairie restoration program. Because Tall Grass Prairies are a rare ecosystem (less than 1% remains in the United States), the students help harvest seed, remove invasive species, process and participate in seed broadcasting. The community has also been a part of studies and tours of the WIS Prairie. Learning about this rare ecosystem and how to care for it gives individuals a greater respect for, and increased desire to care for, our fragile environment. Established in 2013, the McFarland Community Garden Committee invited the McFarland School District to take part in a school food garden. In 2014, the Legacy Gardens were planted by the students. Each year, the 1st & 2nd grade teaching team, Outdoor Education Coordinator and the McFarland Community Garden Director, lead the students on a journey through gardening. The 1st graders start seeds in the classrooms, watch their seedlings grow under grow lights and plant their seedlings in the spring each year. Each of the classrooms has a plot, where they grow a variety of produce to be harvested by the same students as 2nd graders, the following school year. The garden yield becomes part of the CEPS Harvest Meal lunch. The extra produce often goes to the McFarland High School, where it is prepped and used by and for the high school students. From planting to harvesting, the students gain a great understanding of what it takes to be “little farmers.” The goal is to have the students want to continue to try healthy, fresh foods, plant their own gardens and be “little farmers” one day, so the “Legacy” continues. Copyright © 2019 McFarland School District. All Rights Reserved.